Back when smartphones were first released to the market, musicians used the microphone on their smartphone to tune their guitars. This type of tuning was great to use if you were in a pinch and needed to tune quickly, but it didn’t give you spot on results. 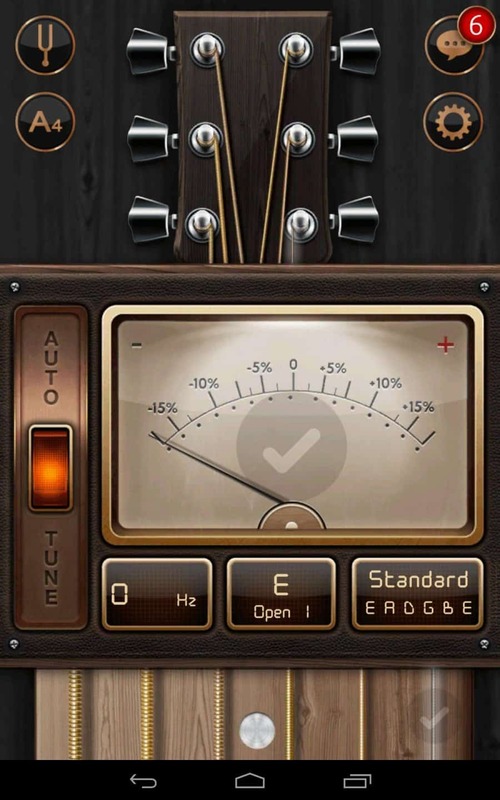 Since technology has improved, the guitar tuner apps on smartphones are much better than they used to be. 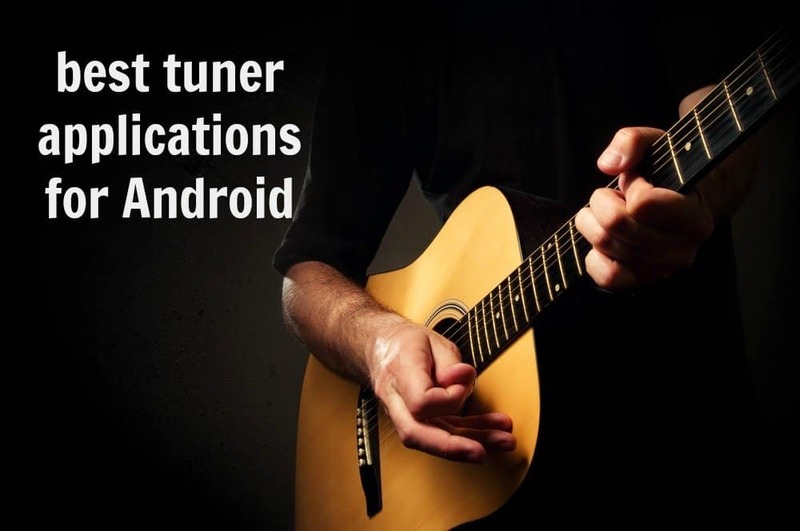 Today, I’ve created a list of the best tuner apps for Android devices for string instruments. I enjoy using this tuner because unlike other tuners that we’ll talk about here, this tuner has a digital tuning fork; I find that these tuning forks really allow you to get your tuning accurate, within an exact cent. Chromatic Guitar Tuner is a simple tuner that has a really attractive interface, too. The biggest complaint that many people have with this guitar tuner is that it has live ads ever so often. Out of all of the tuners that we have listed, the Cifra Club Tuner is the simplest tuner on our whole list. 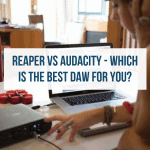 It’s completely free and does a great job of tuning quickly. The Cifra Club Tuner is compatible with ukulele, bass, banjo, acoustic, and electric guitars. This is a quick and simple chromatic tuner that’s free in the app store; if you’re looking for a tuner that’s a bit more complex, you can pay for additional features. If you’re looking for a simple tuner, download the free version of Da Tuner. However, just pay $2.93 and you’ll unlock a tuner that will really open up your world. When your instrument is properly in tune, the whole screen will light up green, which makes it a lot easier to see how well you’re in tune, rather than looking at a dial or a fork. Also, if you’re really not that into technology, this tuning app still works on older Android devices. 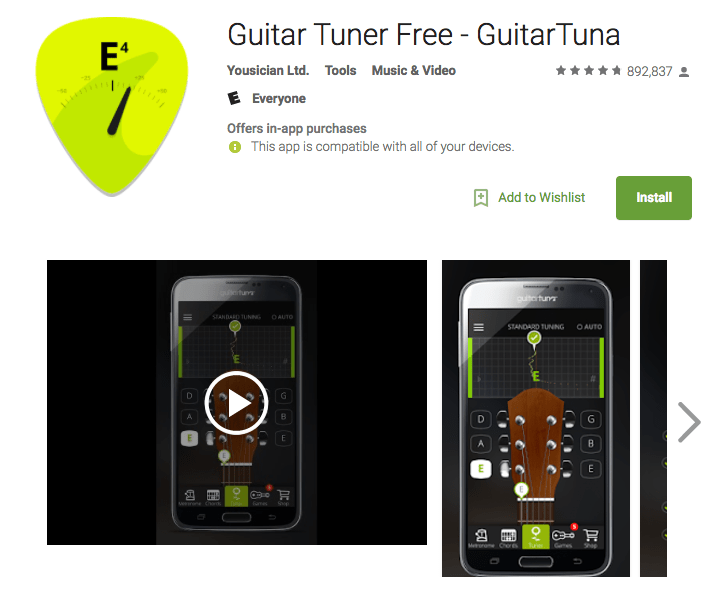 Some guitarists aren’t looking for a tuner app that has a whole bunch of bells and whistles. The Pro Guitar Tuner was created with pro guitar players in mind; the version that you download from the Google Play store is free. Personally, I was happy with the free version. The upgraded, pro version was pretty expensive, so if you’re just looking for a tuner that doesn’t have a whole lot of extras in it, I would just tell you to stick with the free version! Also, this app allows you to tune your instrument as it supports many stringed instruments, but it also allows you to pitch check your guitar. Pano Tuner is another tuner that I used all throughout high school, but I used this for my wind instruments. Whenever I was in a pinch and needed to tune my guitar in a couple of seconds, I would use Pano Tuner. 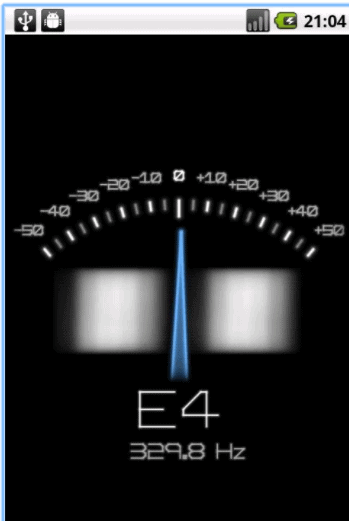 This tuner is an extremely simple tuning application that has a dial style tuner. I enjoyed used this app because it allows you to adjust the sensitivity of your microphone, supports non-standard tuning, and allows you to adjust the concert frequency. You can use this for any string or wind instrument, not to mention that it’s completely free. This is one of the older guitar tuners that’s still on the market today. You can control the theme of this tuner, as well as the microphone sensitivity. This is another simple guitar tuner that doesn’t have a whole lot of bells and whistles, but still has the most important features that a musician needs. 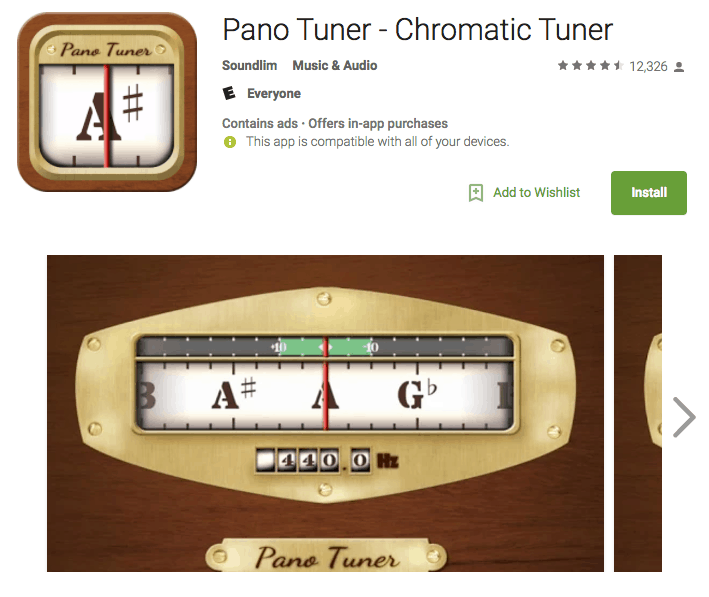 If you’re looking for a tuner app that’s a bit more complex compared to other tuners on the Google Play Store, Smart Chords and Tools is an app that works with most stringed instruments, along with a few other bonuses too. Smart Chords and Tools is an app that is completely free to download but does have the ability to purchase extra items within the apps. In addition to tuning your struggled instrument, this app also has two hundred pre-defined tunings, over two hundred and twenty chords all stacked away in a chord library, and different level settings for those with different experience levels. There’s a lot of information that’s stashed away in this app that would make any guitar players life easier, but Smart Chords and Tools is an excellent app for anybody to use who are looking for a tuner. All throughout high school, this was the application that I used to tune my guitar. Originally, I only downloaded this app because it was free, but after downloading it, I realized it was much more than just a guitar tuner. After using the app for a little while, I discovered that it was developed by Yousician, which I thought was very interesting. Guitar Tuna comes with a tuner that’s worth of professional quality, a very simple interface, a built-in metronome, and several other features that made learning guitar much easier. Technically, this Pitch Lab Guitar Tuner is completely free to download from the app store; you will receive the free version of this app that does have some really nice qualities to it, but I personally liked the upgraded version much better. For $2.99, you can upgrade Pitch Lab Guitar Tuner to the premium version, which will give you access to a stage tuner, a chord matrix, a pitch spectrogram, a polyphonic tuner, and many other options. There are a lot of special features locked away in the upgraded version, o this app makes something great for any musician who is looking for something a bit special. As for the interface of this app, the entire thing is a dial style tuning that offers several virtualization options. It may take some time for you to find the best app for your needs, but there are plenty of free options on the Android market that you can choose from. 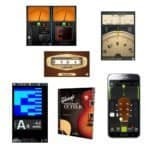 It can become a bit frustrating trying to find the best guitar tuners to use on your smartphone, but I hope this list of the best guitar tuners for Android devices has helped you!